Article 25 of the Constitution of Japan, enacted in 1946, provides, "All people shall have the right to maintain the minimum standards of wholesome and cultured living. "This means that Japanese people have the right to keep these minimum standards of living as a basic human right. Section 2 of this Article provides, "In all spheres of life, the State shall use its endeavors for the promotion and extension of social welfare and security, and of public health." Article 25 of the Constitution provides a basis for the Japanese social security system. Medical insurance and pensions for all people were legalized in 1961. In the 1960's, all social security systems, such as medical services, pension, and workers' compensation insurance ware reformed drastically. Consenquently, the Japanese social security system improved substantially. However, the social security system showed signs of regressing when Japan entered a period of low economic growth during the oil shock of 1973. Faced with an aging society in the future, a review of the social security system became a matter of great national concern. Given the above background, in 1977, a collection of mainly social security law scholars established a social security law study group to reform the social security system with the goal of protecting and assuring the social security rights of people. This study group held its first inaugural meeting on an Aging Society and Problems of Employment and Pensions (in Kyoto) in October, 1977. 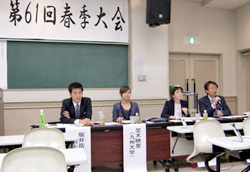 Until the 9th Congress (in Osaka) in October of 1981, congresses had been held along with the Japan Association of Labor Law. In May, 1982, at the 10th Congress (in Ehime) on Legal Problems of Aging Welfare and Healthcare, the Japan Association of the Social Security Law was established. The rules of the Association, including the election rules for directors and auditors were proposed at that time. Until now, the congresses of the Association have been held in spring and autumn, and the Journal of Social Security Law has been published annually. Many members of theAssociation have also attended various international congresses. In 2002, the International Exchange Committee was set up in order to expand the activities of the Association to other countries, through activities such as holding international symposiums and increasing foreign membership. In the beginning, there were only 100 Association members. However, the number has now increased to around 600. These members have diverse backgrounds and include academics, lawyers, national and local government officials, employees of social welfare institutions and graduate students. 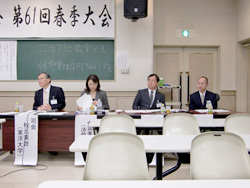 In October 2001 to commemorate the 20th anniversary of the association, a special congress was held at Tokyo University on Medical Treatment and Insurance Reform. Also, the Association published a six volume series on Social Security Law through Horitsu Bunkasha Ltd. This includes Volume One: Social Security Law in the 21st Century; Volume Two: Income Security Law; Volume Three: Social Services Law; Volume Four: Medical Services Law/Long-Term Care Services Law; Volume Five: Housing and Facilities Services Law/Public Assistance Law; and Volume Six: Social Security and Law in Related Fields-Extension and Development. Eighty-one Association members contributed articles.